Update: This paper was chosen as a Best Paper at CSCW 2015. You can download the paper here as well as the slides from my presentation here. Copyright is a difficult area of the law, but now with so many of us creating content online, it actually matters for normal people and not just lawyers and corporations. The law around reuse and remix is particularly confusing, and this kind of creativity is really common: everything from remix videos on YouTube to image memes shared on Facebook. In online communities where people share creative work, it’s not surprising that copyright is a frequent subject of conversation as creators try to work out what’s okay and what’s not, while negotiating multiple sources of rules like law, website policy, and social norms. We wanted to better understand the challenges that they face in this uncertain legal environment, and how the law impacts creativity and technology use. We (myself, my adviser Amy Bruckman, and MS-HCI student Jessica Feuston) conducted a large-scale qualitative content analysis, hand-coding hundreds of public forum posts. These posts came from eight different online creative communities representing different types of content creation (art, music, video, writing). We used a grounded theory approach to analyze this data, converging on themes related to the problems creators faced related to copyright. Avoiding trouble. Creators often wanted to know if some piece they had created might be copyright infringement, or asking advice on how to avoid infringing (e.g., “Is it legal to use extracted vocals in remixing a song?”). Dealing with consequences. Sometimes creators are accused or officially sanctioned for copyright infringement and either don’t understand why, want to know what to do now, or think that the accusation was unfair (e.g., “I posted a YouTube video and used some music, and got an email saying it was copyrighted… will I go to jail?”). Fear of infringement. Creators are also concerned about protecting their own rights in their work (e.g., “I want to make sure that I can display my wart but not allow others to copy it; how do I do that?”). Dealing with infringement. If a creator suspects that someone has infringed their copyright (or someone else’s), we often see pleas for advice or calls for public shaming (e.g., “Someone stole my work, what do I do now?”). Incomplete information. A lack of understanding the law or site policies is an overarching problem throughout all these categories, but often there is information seeking outside discussion of specific cases, or just expressions of confusion (e.g., “I don’t understand why this is allowed but this isn’t”). Also within these categories we saw evidence of chilling effects – people deciding not to do something that they should be able to do for fear of legal consequences – and also examples of copyright policy affecting decisions of what kind of website or technology to use. We also saw a great deal of misinformation proliferating, with many questions being answered with incorrect legal information. Confusion and misinformation can also be exacerbated by disconnect or even contradiction between multiple sources of rules: law, website policy, and community norms do not always provide the same answers. Though we saw little evidence of actual legal problems, creators in these communities do face bad outcomes related to copyright: work being removed from the site, work being copied without permission, deciding not to share their work due to fear of legal consequences or fear of someone else copying, or being ostracized or shamed due to violating a rule or norm. Chilling effects in particular result in less creativity, which is bad for the websites, the creators, and the consumers of that content (not to mention, against the spirit of intellectual property protection in the Constitution). These effects can often be directly traced to misunderstanding or mistrust of website policies for handling copyright. In conclusion, this study revealed that copyright is an important aspect of interactions between creators in online communities, and therefore should be an important part of the user model in design decisions. We should not only be thinking of ways to help creators better understand copyright, but also considering the implications of the ways they currently understand it as well. For more detail, see the full paper. I presented this work at the conference on Computer-Supported Cooperative Work & Social Computing (CSCW) in Vancouver in March 2015. 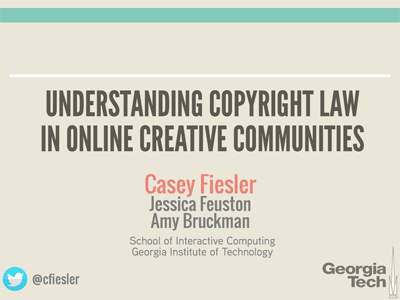 Fiesler, C., Feuston, J.L., and Bruckman, A.S. Understanding Copyright Law in Online Creative Communities. CSCW ’15: Proceedings of the 18th ACM Conference on Computer Supported Cooperative Work & Social Computing, (2015). A good article on a tricky topic, no matter where you live in the world. Thank you very much for sharing such an important topic with us. I think it is a frequently asked question now-a-days. I think a exact law should be created against piracy and also should implement it hardly. As you’ve highlighted in this article one of the most difficult issues is clamping down on individuals whom are guilty of evading copyright law without impacting the online experience of innocent users. Thanks for bringing it to our attention!